Can the Tritton Warhead 7.1 Xbox 360 gaming headset claim the crown from its rivals? The Tritton Warhead 7.1 has has an incredible feature set and is beautifully designed – but is it the very best headset for the Xbox 360? 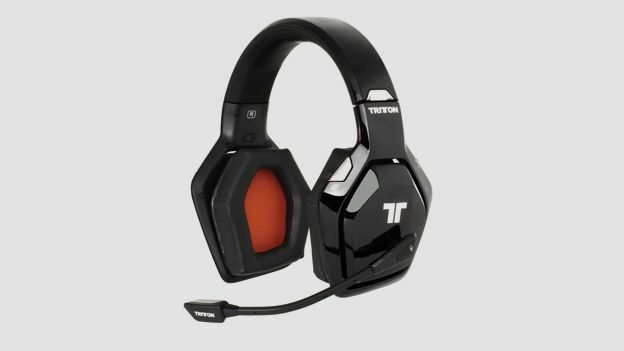 The Tritton Warhead 7.1 is the company's first high-end gaming headset designed specifically for the Xbox 360 and, no doubt with an eye on Christmas, it aims to become something of a status-symbol for Xbox 360 owners. But does it do enough to take on its main rivals, including the Astro Gaming A50 and the Creative Labs Sound Blaster Recon 3D Omega? First impressions are very favourable – as they ought to be at the price. It's aesthetically pleasing, with lots of classy piano-black plastics and chrome buttons, and the insides of the trapezoidally shaped earcups are fluorescent orange. Although they're fairly heavy, their level of comfort lives up to their looks. It's difficult to imagine a gaming headset that could be easier to set up on an Xbox 360 – Microsoft's console has some design quirks which have made setting up lesser rivals a tad fiddly. But the Tritton Warhead 7.1 comes with a pyramid-shaped base-station that handles the wireless connection, lets you select various sound modes, acts as a stand for the headset and lets you charge a spare battery which, commendably, comes as standard. If you have one of the new-style piano-black Xbox 360s, all you have to do to set the Tritton Warhead 7.1 up is to connect the base-station to it with an optical cable. Or, if you have one of the old-style Xbox 360s, you have to plug the optical cable in to a special Xbox 360 audio adaptor, also supplied as standard. It's one of the few gaming headsets that, even when used with the original Xbox 360, doesn't require you to hook it up to your controller. The Tritton Warhead 7.1 packs a magnificent sound: there's plenty of deep, rumbling bass, all the clarity you could ask for, plenty of volume on hand and really crisp treble. If you were being niggly, you could argue that the midrange sounds a tiny bit dry: certainly, the Astro Gaming A50 has a slightly warmer, more seductive sound to it. But there's very little to choose between them, and the Tritton Warhead 7.1 has the necessary audio quality for you to be able to pick out incoming footsteps among the crashes and music of even the busiest action game. In other words, even the most committed Call of Duty-ninjas will find them useful, and for more average gamers, they could be a real asset in the heat of a multiplayer battle. You can adjust the equalisation using various buttons on the base-station (there are music and movie-specific settings), and adjust game audio volumes on the headset. The Dolby Pro Logic 7.1 surround-sound works beautifully, giving a precise sense of which direction incoming fire and footsteps are coming from. One of the Tritton Warhead 7.1's most impressive aspects is the presence of some really thoughtful design touches. Chief among which is that it comes with two batteries, so you can charge the spare one in the base-station while a charged one is powering the headset. So, unlike all other wireless headsets, there's no need to wire it up temporarily while it recharges. It even comes with continental and American plug adaptors. And by pressing a button on the headset, you can toggle between hearing or muting the sound of your own voice while you're playing. The Tritton Warhead 7.1 most assuredly achieves its goal of being one of the best Xbox 360 gaming headsets that money can buy. It's beautifully made, rammed with thoughtful and genuinely useful features and sounds superb, although not quite as warm and inviting as the Astro Gaming A50 or Creative Labs Sound Blaster Recon 3D Omega. The way in which it operates truly wirelessly, even with an old-style Xbox 360, is a boon, too. The perfect gift for the keen Xbox 360 gamer who has everything.